There are five 5 main factors, why the piano goes out of tune. To enumerate those factors by importance. According to my record and research. and maintained normanly ,the pitch goes 20cent (similar to percent) up from beginning of spring to end of summer and 40cent down from beginning of aurumn to end of winter. Even though it was cutted for a long time ago and it's definitely dead. The wood in the piano react like a live one. Under such a condition the quantity of the water which the soundboard absorb in the air is huge amount, as a result of interaction comes out without delay. Problem is the lower end of the string and wire in the piano are linked to bridges. And "bridge itself is bonded to soundboard” to deliver vibrate from strings and wires to soundboard. Yes, this is the inevitable problem. As the soundboard shrink and expand, the tension on the string and wire are Changing. As the tension changes the pitch changing. So let's just say it a constant. "A denominator, Water vapor capacity will be decided by air pressure and temperature." We can not control the air pressure either. It will be decided by Butterfly's wing. Now only "temperature" remains in the formula. This is the only variable in my story. Just imagine that you ordered one can of pop in a restaurent. And waitress brings a glass with it. So that you can pour it into the glass. the height of your coke looks shallow after pouring it. the height of your coke looks deep after pouring it. "The area of the glass" means "Temperature"
"The height of coke" means "Relative humidity"
During pouring coke in your cup, if the height became heigher than cup's capacity for its narrow area of the glass. Without any supply actual water in the air. Let's see what happens in our house in winter. Outside is Sub-zero enviroment,No raining or snowing during recent 7days. Without raining no actual water supply in the air. Also due to low temperature outside quantity of water in the air outside is very limited. But you are running a heater without a humidifier. So the humidity is arount 20% sometimes less than that. on there you can see current "temperature and Relative humidity" Outside of the house. If you have a hygrometre,please check the temperature and humidity inside of the house either. 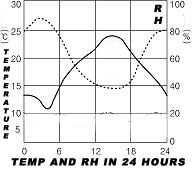 Put outside temp,RH on the calculator and writedown actual humidity in the calculator to know quantity of actual water contains in the air per M^3. water in the air from the natural surrounding. Now put temperature 25 and then set the Relative Humidity 45%. Yes, that's our final goal to keep it safely. Result on 3 - Result on 1 = Needs of actual water in the air to keep the piano perfectly. Yesterday was 2006/12/14 and today is 2006/12/15. to keep 45% humidity in my house. Follow this link if you are interested in all these informatioin, and make sure everything. Summary: Don't change the temperature. For it changes Relative humidity. The average modern piano has over 230 strings under a combined tension of 15 to 20 tons. A concert grand piano may have a combined string tension of up to 30 tons. Although piano wire is made of steel, it does have some elasticity and does stretch. A new piano, or one that has been restrung, will continue to stretch and go flat for quite some time. If you have ever replaced a set of strings on your guitar, you know what I am talking about! After a piano has been restrung retuned , it needs to be tuned a minimum of four times that first year and a minimum of twice a year thereafter. Even after stabilized,actually stretching doesn't stop. It only slows it's speed. genuine skill of each piano technician. Or maybe I can call it a cracked pinblock. 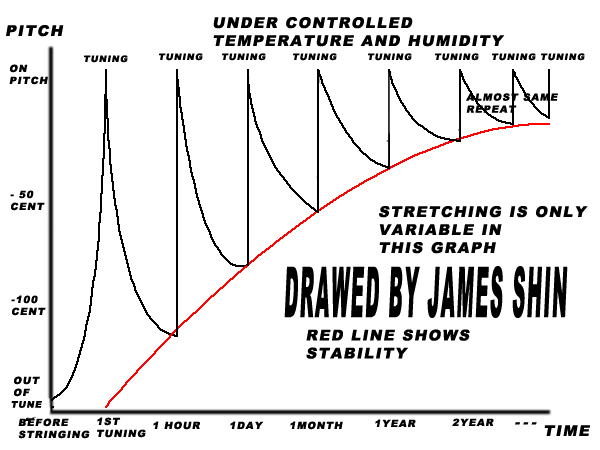 Usually that red area will wearout when ever you tune your piano. 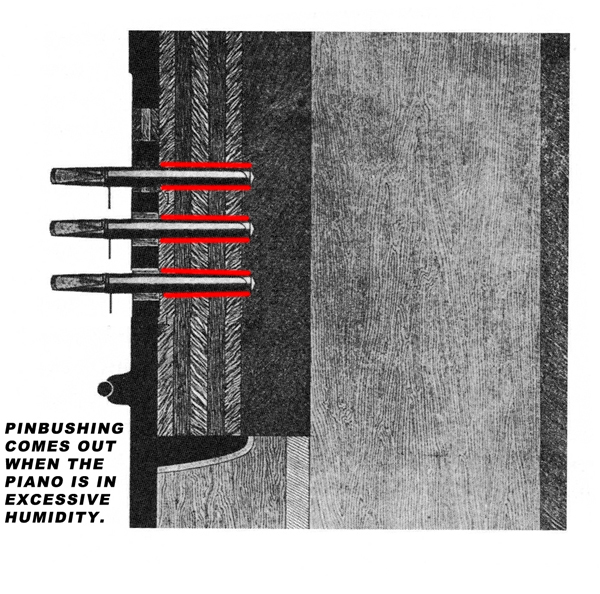 between tuning pin and pinblock. In the dryness. The pinblock shrink so there's no friction. Unable to tune such a piano and it's called "Dry Out"
If the pinblock was soaken by the rain or dripped coffee. It also weaken the friction. 3 to 5 times faster than normal. Although you kept it perfectly. There's possibility the defect from the nature it self. Eventhough it was firmly checked and selected woods before manufacturing. The wood always has a node and it exist somewhere in the layer as a part of laminated thick block. Sometimes it makes such a defect eventhough it was only 5 years old piano. Pray before you buy the piano. It's not a big factor but it still exist. is not only they have sensetive ears but also this reason. shock on the string sot that make the piano out of tune. hard player's piano goes out of tune in short time.